An event in Central Park to raise awareness for diabetes? Sure, let me check my schedule. 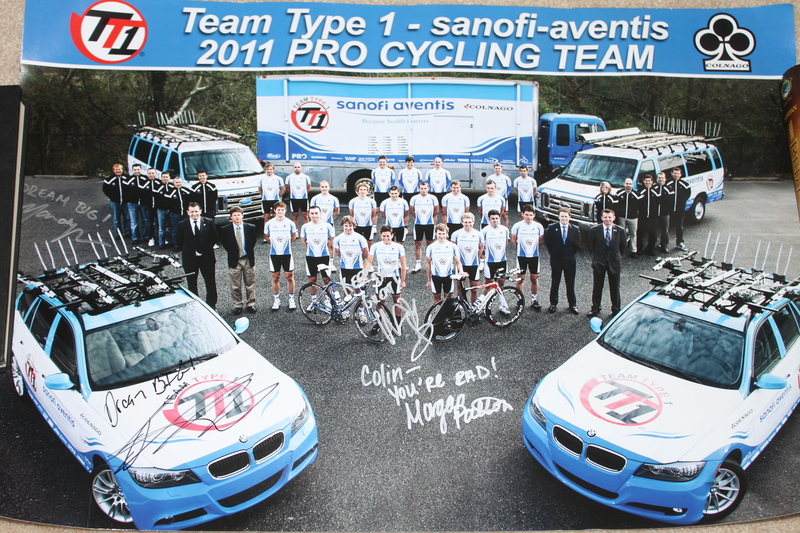 It includes a bike ride with Phil Southerland and Team Type 1?! Clear the calendar; we’re there! That’s exactly how it went. I gave no thought to logistics nor did I consider what the ride would entail. I just knew I wanted my family to be there for this unique opportunity. 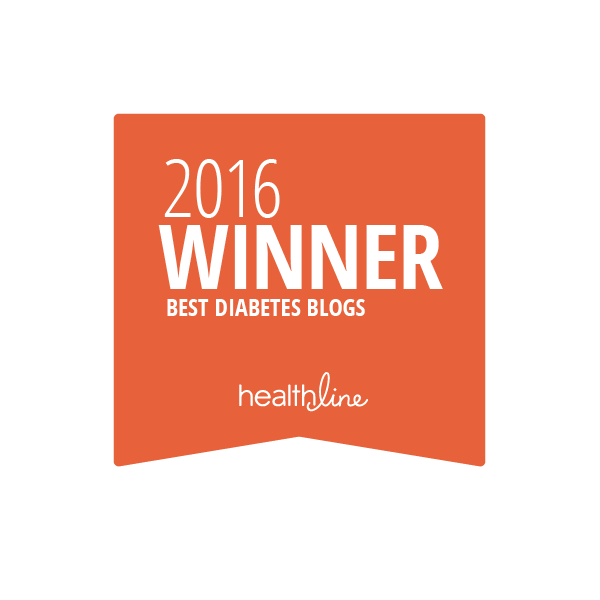 I have two sons: an eleven year old aspiring triathlete, and an eight year old who loves to ride his bike and is living with diabetes. I also have a six year old daughter, who is very supportive of her older brothers and their ambitions. 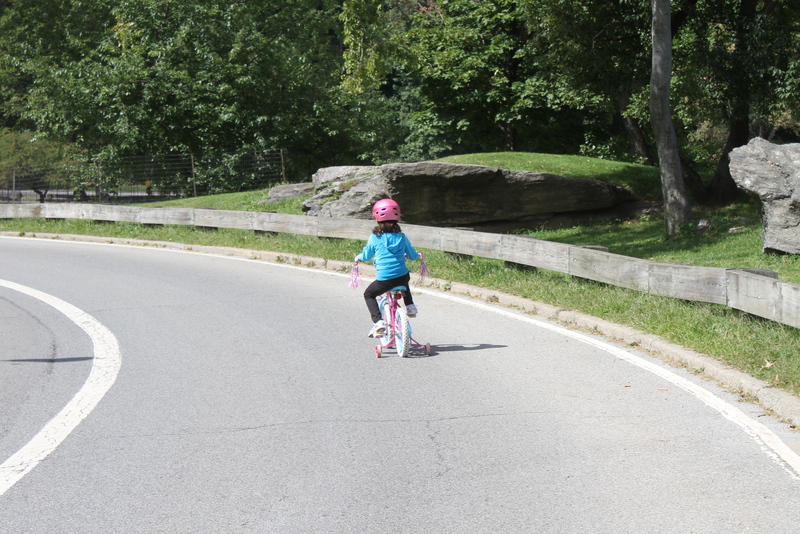 Had I given it any thought, I might have considered that Central Park is not exactly flat and although Caleb has ridden his bike in the road for hours at a time, he’s never done anything remotely close to a four-mile, non-stop trek. But I didn’t give it any thought. At least nothing beyond that Caleb might get to meet Phil again and if any of us couldn’t cut it, then we would stop. No big deal. That’s not at all how the ride went. Colin and Caleb had personal Team Type 1 escorts around the entire course. Thankfully no one buddied up with me. I thought my years of biking in my younger life would mean I would be the front runner of my family. I was left in the dust. Way back in the dust. I was grateful that my kids had responsible adults with them since I was not. I was even more grateful that no one was matched up with me because that would have been embarrassing. John Martin was the gracious team member who took the initiative to stay with Colin. Caleb had the honor of taking the ride with none other than Phil himself. It was a gorgeous day. Perfect for a bike ride. There were lots of riders and pedestrians in Central Park. But then I realized something was wrong. Phil was huddled with his arm around Caleb. I realized Caleb was crying and his leg was bleeding. Then I saw his hands were bleeding. He was scratched up, but okay. Phil was with him. The first thing I remember Caleb saying was to Phil, “I’m sorry I broke your bike.” I realized John was right next to me holding half of Phil’s bike up with a bit of a shrug. I mentioned that Colin is an aspiring triathlete. He had the honor of partaking in a triathlete camp this summer with Ironman, Cliff Scherb. He has a dream of getting a bike like Cliff’s. Right now that’s all it is: a dream. Those things are expensive. I knew Phil’s bike was of that caliber. Phil’s concerns, however, were only for Caleb. Apparently some pedestrians cut in front of them. They both swerved to avoid them, but there weren’t enough places to go. Caleb turned into Phil’s back wheel and they crashed. We were almost at the end. Caleb and I walked the rest of the way. We had all taken a wrong turn, so it ended up being closer to six miles than the planned four. Lila had a respectable showing even if she didn't finish. Despite the crash, it was a great day. We thought we would take a ride with others in the spirit of awareness, but it ended up being so much more. It’s a day none of us will forget. Phil, thank you for sharing yourself and your story with us. Thank you for showing my children they can do anything they set their minds to. Thank you for being kind and gracious; for setting such a gentlemanly example for my boys to follow. 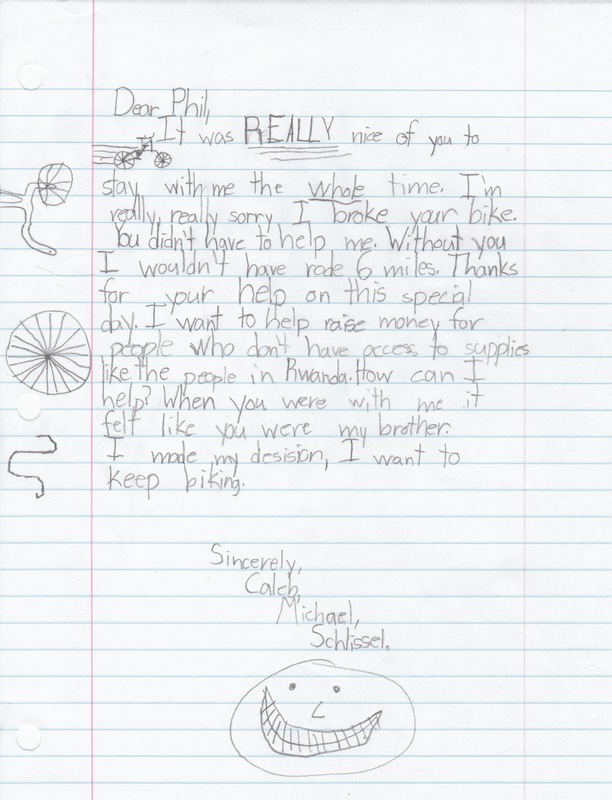 Thank you, Phil, for staying with Caleb and for pushing him up those hills. There is no way he could have done it without you. 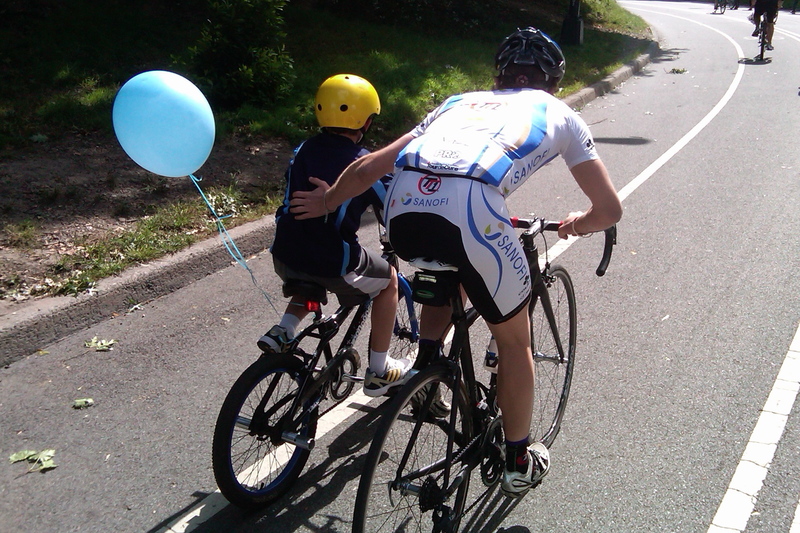 He is so proud to have completed the ride and for having you at his side. John, thank you as well for staying with Colin and encouraging him. It would have been a bit of a bummer if he had to stay back with me. I’m so grateful you were there to allow him to go at his own speedy pace. You too were so gracious and kind to all of us. I can never thank you enough for the pictures. They are priceless. We have had the privilege of meeting several Team Type 1 team members. They are all, without exception, inspirational athletes. But perhaps more impressive to me is the exceptional caliber of people they are. They are top-notch, genuinely sincere, kind people. That just sums it all up. If you haven’t already, I encourage you to read Phil’s book, Not Dead Yet. His perseverance, courage and positive attitude are infused into to as you read it. 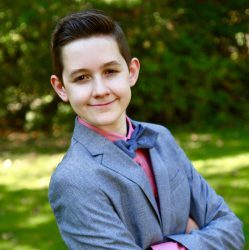 I also encourage you to read this recent interview with him mom, Joanna. There’s no question her strength and never-give-up attitude were a great influence to Phil. Lastly, here’s an article in the New York Daily News which is primarily an interview with Phil about the bike ride in Central Park but also includes a few words from yours truly. Keep riding, or walking or whatever you do. As Phil says, we’re all busy and it’s hard to make time for it, but when you consider that excercise adds years to your life, we really have nothing but time for it. 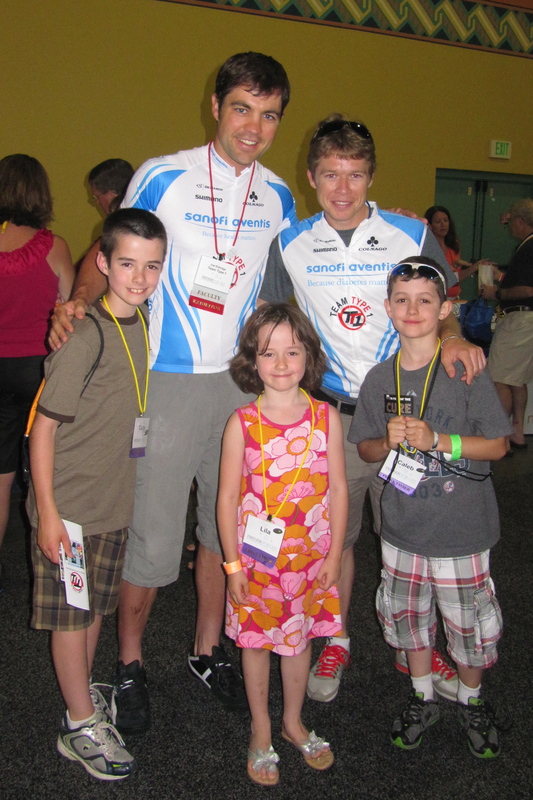 Phil Southerland was THE first type 1 athlete that I encountered after Caleb’s diagnosis. It started with a video, then a magazine article and then I scoured the internet looking for any information I could find on him. 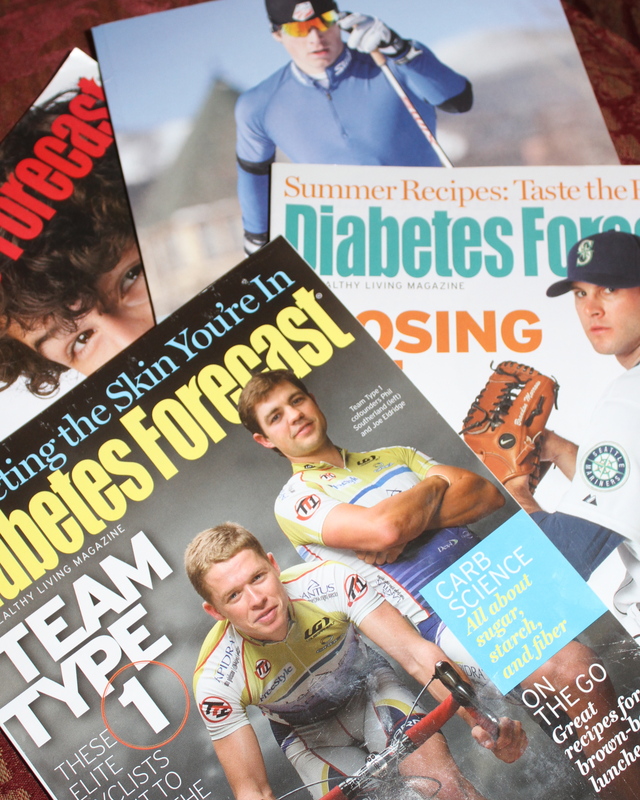 I have always been and continue to be in awe of athletes with diabetes. I have the greatest admiration and respect for their commitment, discipline and achievement. What they do is the equivalent of magic to me. The week before FFL, Colin completed a week of triathlete camp with Cliff Scherb. It was hard to know which one of the five of us was most excited to meet the co-founders of Team Type 1. It was definitely at the top of all our lists. On the first day of the conference, we attended a Team Type 1 focus group and got to listen to three team members, including Joe Eldridge, talk about their experiences. I’ve read his story so many times – about the wager between him and Phil of whomever had the higher blood sugar at the end of a race would have to buy the other dinner, and how Joe ended up buying a lot of burritos. 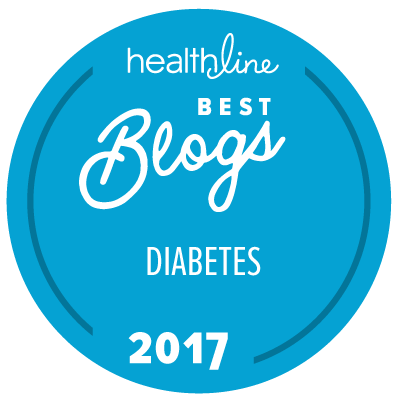 Hearing how that motivated him to keep tighter control of his blood sugars live and in person was just as inspiring as the first time I read it. Then we got to speak to them up close and personal. It was like talking with friends. They are such real and genuine young men. So kind, so sincere. I had brought my copy of Not Dead Yet on the trip thinking I might have some spare time to read. Well that didn’t happen, but I’m so glad I brought it because Phil so graciously signed it for Caleb. A definite highlight for us all. I was happy to have the chance to thank them for the impact they have had on us. It is because of them – Phil and Joe, the first type 1 athletes that I came across – that I have never wondered about Caleb’s ability to achieve athletically. Their impact is so strong, that I’ve almost taken it for granted. It’s completely natural to me to expect that Caleb can do any sport he wants to. 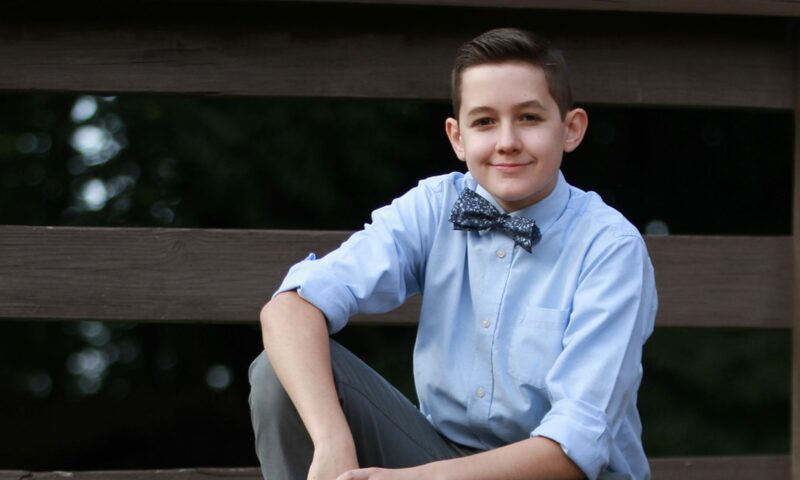 They, and so many after them, have shown all of us that there are no limits to what someone can attain, including someone living with type 1 diabetes. I have always known this for a fact. More importantly, Caleb knows this. He never, ever considers whether diabetes will impact his ability to play or complete. He knows that he can do whatever he chooses. He knows he needs to care for his diabetes which means he needs to do things his teammates do not, but having it hold him back from doing what he enjoys is never something that enters his mind. These are the only publications that rest on the cocktail table of my living room. Team Type 1 has been and will always be a part of our lives. We’ve met so many great role models. 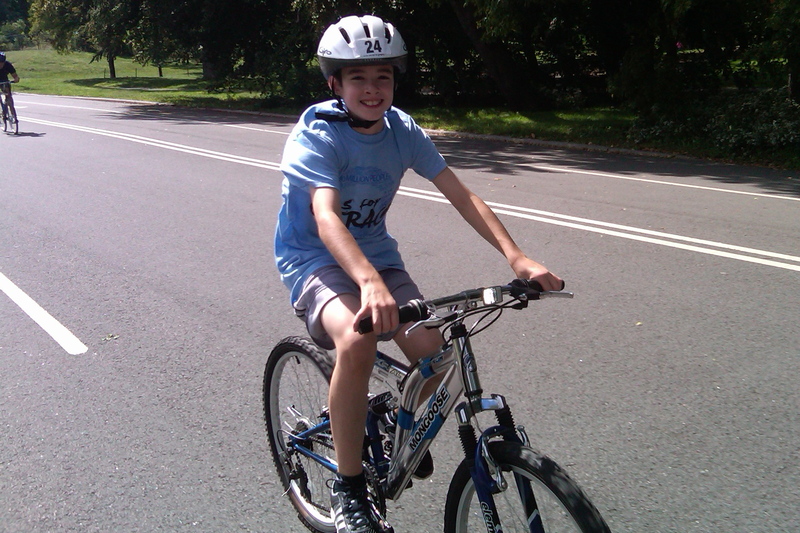 They are examples for Caleb, as a type 1 diabetic, and Colin, as an aspiring triathlete. Thank you Phil and Joe and Cliff and Bradford for reaching out and sharing yourselves so openly with us. Not only are these guys all amazing athletes, they are truly amazing people. I am so very honored and privileged to have had the chance to meet them. We all are. If you haven’t seen the video, One Shot, the documentary of Phil and Joe and the team and their quest to get the first type 1 diabetic into the Tour de France, I strongly encourage you to. 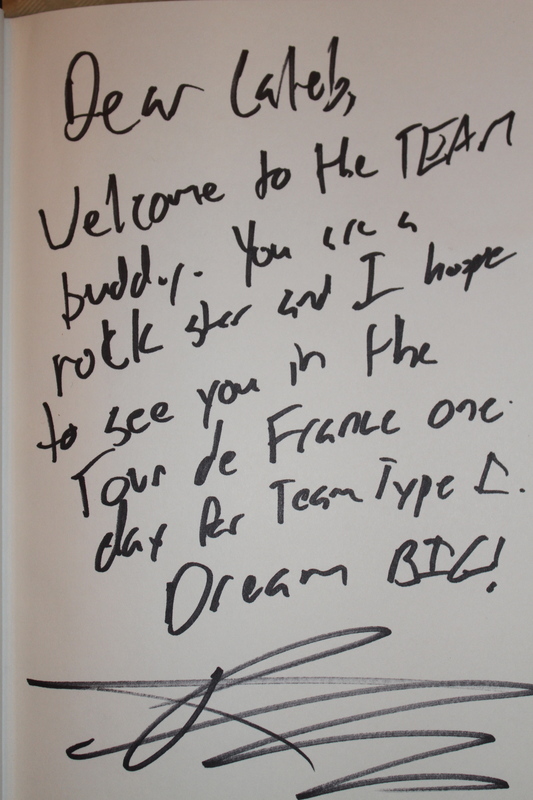 When they are in the tour, we will definitely be watching and rooting for Team Type 1. Colin's autographed poster that we managed to get home in tact.